Today is yet another special occasion to remember and honor those beautiful souls who have taught us how to read and write, and to distinguish between what is wrong and right. We all are the direct products of sacrifices made by our teachers who have committed their entire life to show us the path that has led us where we are now. Had it not been for their selfless contributions and hard work, we would have never got the inner vision of our life. They are the ones who have ignited our imaginations and dreams, and instilled in us the love of learning. Every teacher often goes beyond his or her prescribed role to support and guide the students onto the right path. It is absolutely true that if a teacher fails, the entire society fails. Looking at our own successes today, it is clear that none of our teachers has ever failed. On this auspicious day, it is important for all of us to recognize the contributions made by our teachers in shaping the future of each of his or her individual pupil in the classroom and to honor them for the unconditional love, support and guidance they provide to their students every day. 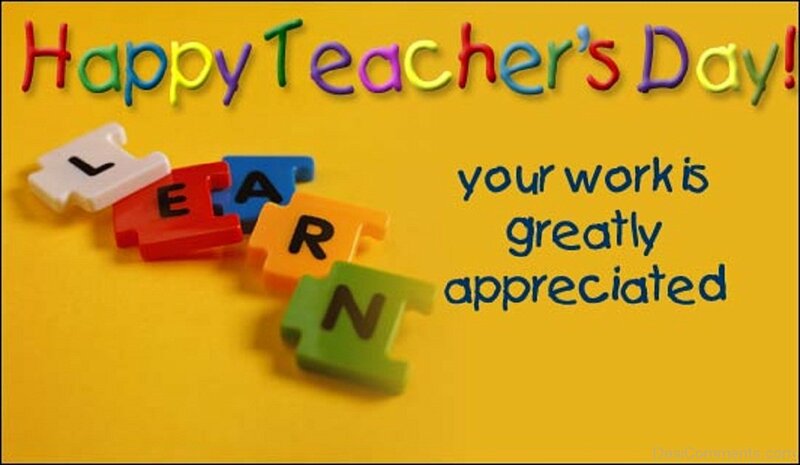 No words can ever describe the amount of gratitude we owe our teachers for transforming our lives. We won’t have great doctors, engineers, architects, pilots or other professionals in the society today if we did not have teachers. They are the cuckoons that hold us as caterpillars and groom us to become beautiful butterflies. We can never pay back for what they have invested in us. As a student, I have clearly seen how much difference my teachers have made in my entire life right from my first day in school till I graduated from the university. From a raw, innocent and rough boyhood, a refined soul has been crafted. I would like to thank all my teachers for bringing a new light in my life. To me, every teacher is an embodiment of love, compassion, patience and discipline. I was fortunate to have got the opportunity to learn from some of the best teachers on Earth. As a parent today, I still see the blessings of teachers in the progress of my children. Having gone to school with a blank head, today they are able to comfortably read and write, and think creatively. This is the unparalleled power of teachers. It is true that a teacher is born, not made. One has to have the innate passion to work with kids. So on this special occasion, I would like to congratulate all the teachers in Bhutan on taking up such an important role. The gifts our children have shared with you today should remind you that you all are very special. The lessons you teach, the knowledge you share, the care you take and the love you give every day would certainly add values to their lives and help them secure a promising future. Although your praises are hardly sung, you are still our great heroes. The success of the leaders and professionals who have studied under you should be the greatest reward you could ever have as a teacher. You are the engine of a nation. Keep up the good work and let your blessings continue to flow through your students all the time. A very happy Teachers’ Day to all my teachers and the teachers of my children in Changangkha Middle Secondary School in Thimphu.